Centralize and make searchable reference information & content. Automate chaotic processes. Breaches and hacks and leaks oh my! 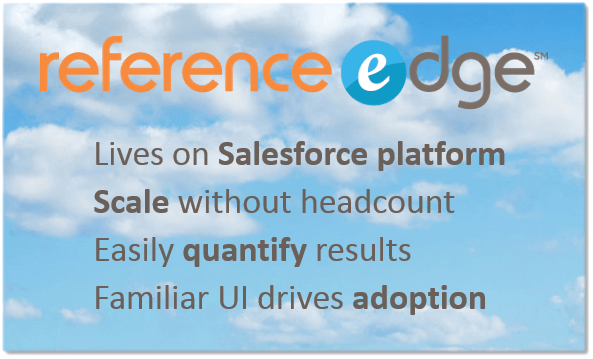 With ReferenceEdge your data is safe and secure in your Salesforce environment and nowhere else, so no GDPR worries. Centralize customer reference data, quantify program impact, scale through automation not headcount, and spend your time where it counts. Be a reference hero! Complete customer advocate information for use by all departments. Prevent overuse and integrate customer health, net promoter scores, and other customer success indicators with customer data. Guarantee your sales and marketing teams fast access to accurate customer advocate accounts and their stories, and quantify marketing’s contribution to revenue growth.